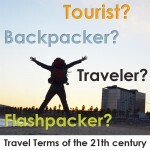 Gomio.com examines the terminology of the modern travel industry. Make the mistake of calling a “hostel-traveler” a tourist and you may find yourself getting a cold shoulder and stink eye… if not worse. Aren’t there several ways to travel, to discover, to explore? Doesn’t this mean there are several types of travel-philosophy’s? 1. Traveler – What’s a Traveler? A traveler is more than someone who travels; it is also someone stricken by a perpetual state of wanderlust. Travelers are those who have a bottomless passion for a nomadic lifestyle that promotes spontaneous encounters with new people, new experiences, new cultures and new perspectives in new places. To a traveler, a map is more of an impediment than a tool, and getting lost is more of a destination than it is a detour. Just because you visit some “touristy” spots while you’re traveling does not, in itself, make you a tourist. Rather, tourists have the come, see, conquer attitude and are satisfied, and relieved to return home, after having checked off their list of attractions to visit. Tourists visit a location from a closed, outsider’s perspective, with their native culture, language, knowledge and worldview still intact. But travelers explore a location with an open perspective, and leave with their native culture, language, knowledge, and worldview forever changed. Tourists come to vacation, whereas travelers come to experience, and ultimately, to grow. 2. Tourist – What’s a Tourist? If you choose to eat your usual Whopper sandwich, or anything else, from Burger King while you’re abroad, then you are a tourist. If you complain about the cash register not knowing your language while you’re abroad, then you are a tourist. And if you just consider taking pictures of the “Top Five Things to Do in Germany,” or taking an all-inclusive cruise with a boatload of fellow Americans to the Bahamas to be true traveling… then sorry to say, but you’re a tourist. If you complain about the cash register not knowing your language while you’re abroad, then you are a tourist. 3. Backpacker – What is a Backpacker? Backpackers are the die-hard travelers. These are the minimalists that do not mind downsizing their life into a single rucksack light enough to carry from city to city and road to mountain. They are the travelers that are on the road for the longest spans of time, with the tightest budgets, and the most low-maintenance lifestyles. If you’re a backpacker, shower-less days on end will result in nothing more than a shrug and “nappy-hair-don’t-care” slogan. You may also find yourself having a difficult time keeping track of what day of the week it is, or suffering from a 24-hour case of restless leg syndrome. A flashpacker has the same quintessential characteristics of the backpacking lifestyle (lengthy ventures and budget accommodation) but less minimalist and more technology-laden. So while a backpacker prefers roughing it and often feels freer by cutting off contact with society and leaving their iPhone at home, the Flashpacker isn’t so quick to leave behind their iPhone, iPod, laptop, notepad, or other gadgets. Rather, Flashpackers prefer to take advantage of these modern technologies and mold them to fit their specific travel needs. While all travelers and backpackers value social travel, Flashpackers are probably the most notorious for wanting to stay connected abroad. Whether that’s by using Skype to do the occasional catch-up with friends back home, or downloading social travel apps for their iPhones that will allow them to connect with locals and get local reviews on surrounding restaurants and bars, Flashpackers are pros at using technology to enhance their travel experience.